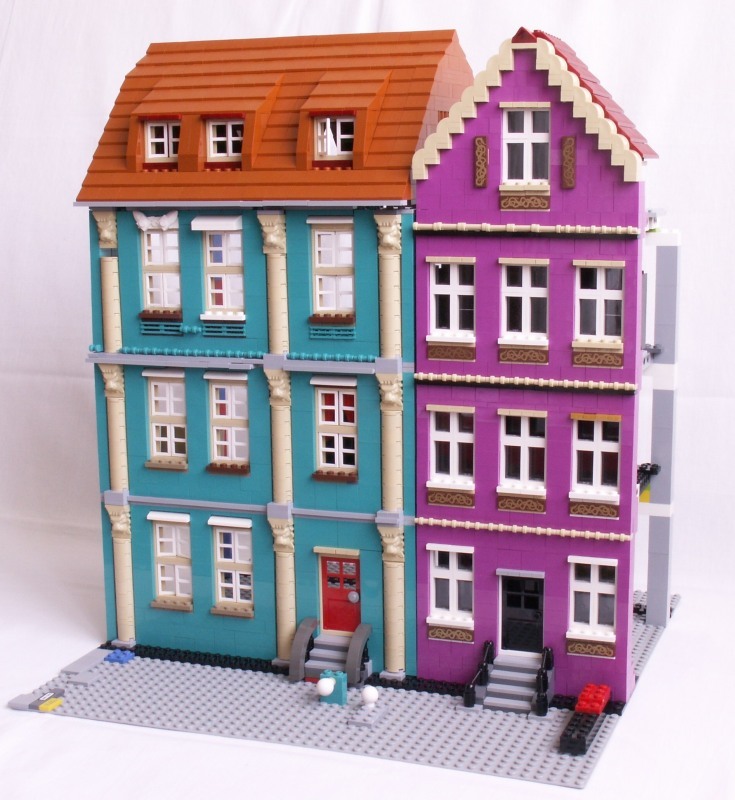 Brick Town Talk: May 2011 - LEGO Town, Architecture, Building Tips, Inspiration Ideas, and more! Another great model by lgorlando that features a terrific forced perspective design. Grab a cheeseburger as you gaze up at the skyscrapers. Some of you may have seen this elsewhere, it is well worth posting it here too. The attention to detail is incredible. Sorry for the lack of posting lately. But I found this one on ClassicTown and figured I should post it here as well. The use of the collectible minigifures and the busy atmosphere make for a great diorama. And, of course, the buildings are fantastic. Sorry I haven't posted anything lately, I've been really busy with a trip to Chicago and graduation stuff. Hopefully I can fit a post in here soon. I have yet to see the cartoon on Fox, but this sure is a great way to see what it's like. This building is incredible, I never really thought lime green and yellow would go so well together. See more pictures over at MOCpages. I've been at BrickMagic in Raleigh, NC this weekend. Yesterday around 1:50 PM, the Pet Shop was officially unveiled. My photography skills remain a bit poor, but I did get some photos of details that I haven't seen elsewhere, like the storm cellar. I can also confirm that the color of the Pet Shop is indeed sand blue. I'll be able to take more photos today and on Sunday - let me know if there are any angles you'd like me to try to get. Word is that LEGO stores everywhere will be allowed to sell these on Tuesday (naturally, the day after our convention discounts expire). You can see my photos from BrickMagic (including the Pet Shop and several great town and train layouts) in my BrickMagic 2011 flickr set. It's finally here! Here's LEGO's most recent addition to the modular building series, 10218 Pet Shop. Press Release Courtesy LEGO. 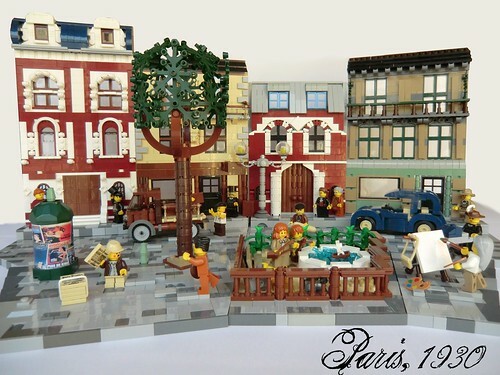 Thank you to ClassicTown and Eurobricks (more pictures available there too) for the news! Hope you enjoy! Thoughts and comments welcome! Unfortunately it's only just the facade that's built (it's still a WIP), but I think it very well compensates for the other three walls. The columns look awesome on that turquoise house. A very clean and sharp design to some residential homes. I don't know what it is, but I've been finding a lot of models recently using rare, or fairly unused, colors...and they look awesome. Keep it up! 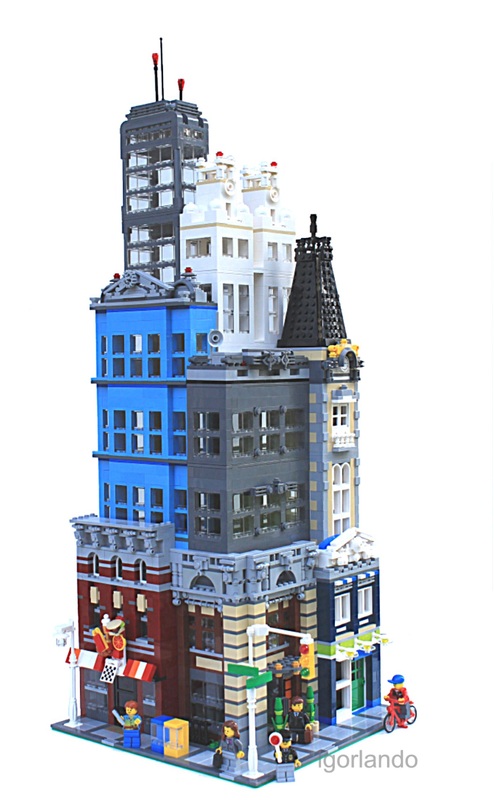 Oh and instructions for this building should be available at his website, Brick City Depot. *NOTE* I am aware of the new LEGO Modular Building (which is a Pet Shop!) being released May 10th. I'm sticking with the original rules and will be posting the official release only when it is available, if you want to see a picture of the set, head on over to The Brothers Brick.